Rate this Article The World Series of Poker is one of the most recognized poker tournaments in existence, but do you know how it came about? Let's find out! The World Series of Poker is one of the most recognized poker tournaments in existence. Every year, players from all over the world flock to Las Vegas, Nevada to compete for millions of dollars worth of prize money across a huge range of different poker formats. Believe it or not, the World Series of Poker has grown from a little tournament held in a small alcove to what is likely the biggest event on the poker calendar, rising in popularity immensely. With more players came more publicity and with more publicity came more sponsors, which, in turn, resulted in even more prize money up for grabs across the tables. The first seed for the idea of the World Series of Poker was initially planted when two men, Tom Moore and Vic Vickrey, hosted what they called the Texas Gamblers Reunion in 1969. Themselves, Benny Binion – who would end up hosting the first ever World Series of Poker the next year – and many other big names of the poker world took part in many high-stakes games over the course of several days. The Texas Gamblers Reunion would never meet again, as, instead, Binion decided to take the idea and create the World Series of Poker. The very first World Series of Poker was held in 1970 at a time when Las Vegas hosted less than 50 poker tables. In fact, the host venue of the first World Series of Poker, Binion’s Horseshoe Casino, didn’t even have a poker room. It may seem surprising given how synonymous the game of poker is with the Old West and gambling in the USA, but there simply wasn’t the demand for a huge number of poker tables back then. For the very first World Series of Poker, about 30 players shuffled around a hotel room-sized alcove to compete for the new poker tournament’s first title. Johnny Moss won the first title without winning a poker tournament, being voted as the best all-around player by the other competitors after many days of high-stakes poker games. In 1971, Binion sought to improve the standing of his tournament and bring it the acclaim that the title of World Series of Poker warrants. Seven players paid a $5000 entry fee, and Johnny Moss returned to claim the winner takes all prize. But, it wasn’t until the 1972 tournament that the World Series of Poker really began to catch the public eye. Thomas Preston triumphed over Walter Pearson – the runner-up in 1971 – in a huge upset victory. Preston then molded his victory into a storm of publicity that reached every corner of the USA. He appeared on television shows, wrote a best-selling book, and was cast in films. Because of Preston, the World Series of Poker captivated the public and media, leading to CBS Sports televising the 1973 tournament. The World Series of Poker continued to grow in format, cash prizes, public appeal, and diversity. In 1978, Barbara Freer became the first woman to compete at the World Series of Poker. Despite being called the ‘World Series of Poker,’ the poker tournament very rarely featured a player from outside of the USA. In 1990, Mansour Matloubi shocked the tournament by becoming the first non-American winner. Coming from England but born in Iran, Matloubi was the first poker player to take the World Series of Poker away from the USA. The Horseshoe struggled with the rapid increase in popularity and participants of the tournament until Harrah’s Entertainment, in 2004, eventually acquired it along with the rights to the World Series of Poker. The group now known as Caesars Entertainment has continued to grow the tournament to this day. They grew the series to 45 tournaments in 2006 and offered over $100 million in prize money. The World Series of Poker has expanded from a Las Vegas tournament to hosting a World Series of Poker Circuit to get more players across the USA to engage in the tournament. Since its inception in 1970, the World Series of Poker has taken place every single year. The 2018 tournament will be the 49th edition. In the 2017 World Series of Poker, there were a record 74 bracelet events for players to compete in. The biggest events, prize-wise, of the tournament, were the $111,111 High Roller for One Drop No-Limit Hold’em for $3,686,865, and the $10,000 No Limit Hold’em Main Event for $8,150,000. For the 2017 Main Event, 7,221 players competed – the most since 2010 – with the top 1084 players finishing in the money. The final table consisted of nine players (two from Great Britain, two from France, one from Argentina, and four from the USA). 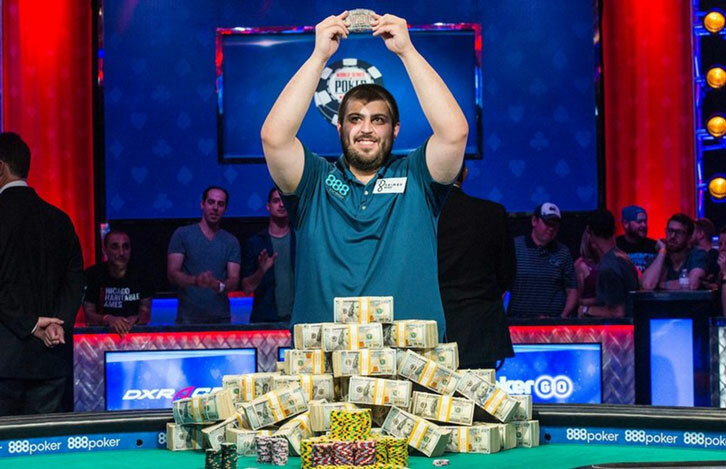 Each player at the final table earned $1 million and the winner, Scott Blumstein, claimed $8.15 million. The greatest number of entrants for a Main Event was in 2006, with 8773 players vying for what is still World Series of Poker record prize at $12 million. Since 2006, the number of Main Event entrants has never dipped below 6350 players. Only nine non-American poker players have won the World Series of Poker, representing seven different countries. Players from Iran (twice), the Republic of Ireland, Ecuador, Australia, Denmark, Canada, Germany, and Sweden have won the World Series of Poker. There have only been three instances where an American player has not been crowned the champion or the runner-up. In 2008, Peter Eastgate from Denmark overcame Russian Demidov to win the $9,152,416 prize. Pius Heinz of Germany defeated Martin Staszko for $8,715,638 in 2011. The most recent non-American winner of the World Series of Poker, Martin Jacobson, bested Norwegian player Felix Stephensen in the battle of Scandinavia for $10 million in 2014. It’s not just the most popular poker game that’s played at the World Series of Poker. Alongside Texas Hold’em, the 2018 tournament will also feature Omaha Hi-Lo, H.O.R.S.E, Seven Card Stud, Razz, and many other poker variants across the events schedule. A very significant event in the history of poker, and indeed the World Series of Poker, was the ‘poker boom’. In 2003, Chris Moneymaker qualified for the World Series of Poker Main Event online and went on to win the tournament and the $2.5 million purse. With that, the ‘poker boom’ began, with more and more people accessing online poker to gain entry to these huge money poker tournaments. The 2003 Main Event saw a record 839 players compete but that skyrocketed to 2576 the next year, and then to 8773 by 2006. It’s the incredible availability that came with the rise in power of the internet alongside the underdog story of Chris Moneymaker that made the World Series of Poker a reality for poker players worldwide. In 2018, the World Series of Poker will host a massive 78 official gold bracelet events, which span the many games of poker. Thanks to the prevalence of online poker, not only can players practice poker and win money in Texas Hold’em, Omaha, or 7 Card Stud rooms in varying formats, such as sit & go’s and tournaments, but they can also win the Ultimate Package to the World Series of Poker. The hand that changed everything. Amateur poker player Chris Moneymaker defeats poker-pro Sam Farha with a full house in the final hand of the World Series of Poker. The immense popularity of tournaments like the World Series of Poker has not only spawned spinoff games like Facebook’s 3D social casino game World Series of Poker, it has also become integrated into online casino sites like 888. Poker is now as popular, if not more popular, than other online casino games like slots, blackjack, and progressive games. Nowadays, poker is recognized as a game where high rollers can leave tables with millions but it is also a popular past time. This was greatly helped by the rise of the internet, the increase in availability of poker rooms on the internet, and the proven chance for anyone to gain passage to huge events like the World Series of Poker through playing online poker.